The Integration Centre said that many of the same issues in Sweden exist here and that policymakers must act to address this. THE RECENT RIOTS in Sweden, mirroring those in France in 2005 and Britain in 2011, should serve as a warning to Ireland of the importance of integration policy and practice, an organisation has said. 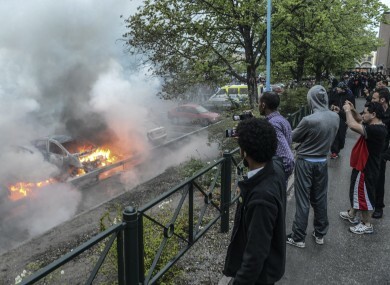 The Integration Centre said today that although Sweden has an excellent “reputation for integration and social harmony”, a week of riots in predominantly immigrant areas points to a failing system and this “should serve as a wake-up call to Ireland”. Killian Forde, CEO of the organisation said that in order the integration to be successful, “it has to be a two way process of learning from and about the host and immigrant culture”. “This cannot take place if immigrants are clustered together in one area, separated from mainstream society,” he said. Recent research by The Integration Centre showed clustering and segregation of children in a number of schools in Cork, Galway and Dublin where some schools had 70 per cent immigrant students while schools right beside them were predominantly attended by white Irish pupils. Forde said that unemployment, schooling and structural racism are said to be behind the riots which have torn Stockholm apart for the last week. He said Ireland is “lucky” that these issues have not led to social unrest up until now but that policymakers need to “take stock and make provisions”. Email “Swedish riots 'should serve as a wake-up call' for Ireland”. Feedback on “Swedish riots 'should serve as a wake-up call' for Ireland”.